by Rocha, K.E. ; Rocha, K. E.
Spencer Plain is ready to help build a new Bearhaven--a place where bears live in community and help rescue other bears around the world. But the city itself is in trouble now--the evil Pam wants to capture the bears and sell them, and it's up to the Council to move the city to a safe, new location. Except that Pam shows up right in the middle of their move, cutting off Spencer from his parents and kidnapping most of the Bearhaven bears. Spencer doesn't know how to keep the free bears safe, save the captured bears, and get word to his parents at the new Bearhaven all at once, but he's going to have to figure it out, fast, to stop Pam once and for all! 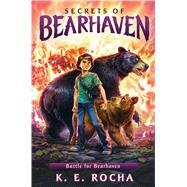 K. E. Rocha is the author of Secrets of Bearhaven, developed in collaboration with Egg in the Hole Productions. She received a BA in English from Trinity College, an MFA from New York University, and was named a Connecticut Circuit Student Poet by the Connecticut Poetry Society. She has never visited with talking bears, although she often talks to her goofy little hound dog, Reggie, while writing from her studio in Queens, New York.